Great ideas and extraordinary teaching happen in public school classrooms all over the country, but these pockets of innovation often don’t get the attention they deserve. More often the schools held up as models for the future of learning started with a carefully articulated vision around change, a hand-picked staff, and even some startup capital. Changing the traditional approaches to teaching and learning that have been in place for decades within an existing school is extremely difficult work. But passionate teachers and leaders are doing just that. Catlin Tucker has been teaching at Windsor High School for 14 years. She started out as the kind of teacher who had every lesson planned out to the minute; the kind of teacher who assigned lots of writing at home, graded everything meticulously, and had very high expectations of students. She was in control of her classroom, but she found that often her students were disengaged. 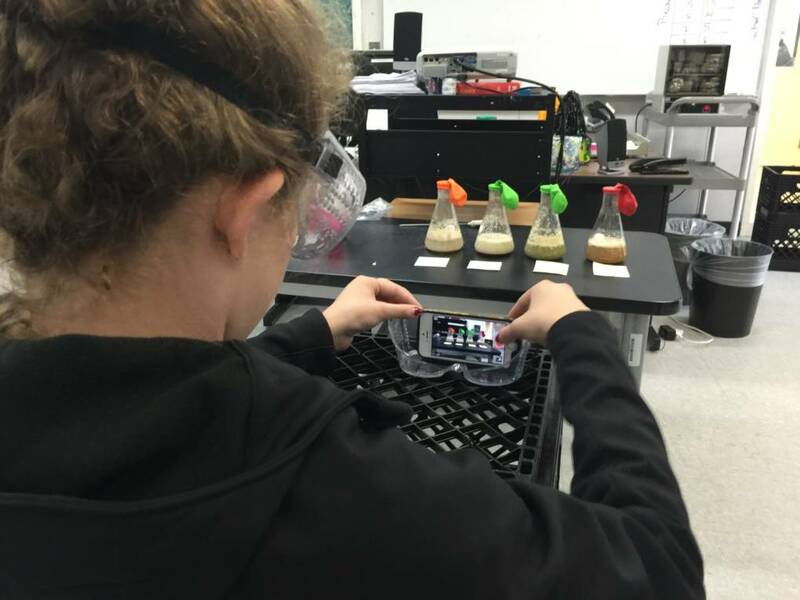 Over several years she began to experiment with using technology to give her students more ways to engage with material and more choice over how they demonstrated their understanding. But the more she tried to innovate within her standard high school English classroom, the more she felt that the structure and system itself weren’t serving kids well. She wanted to shake it up even more. “I did feel like in some ways I had reached the edges of what I could do that was different in an English classroom,” Tucker said. She was even thinking about leaving teaching to become a professional development consultant full time -- something she does part time now -- until she saw Will Richardson keynote an all-staff professional development day at her school. “I sat there and he just spoke to me, to everything that concerns me about education, and the way we're shuttling kids through classes and losing so many of them, and how we have to reimagine learning for kids of this generation.” Tucker said. She immediately went to her principal and asked to pilot a very different type of learning experience within Windsor High School. Windsor works on a “core” model where one group of students share the same English, science and history teacher as a way to create smaller communities within the big comprehensive high school. This schedule allowed Tucker to team up with Marika Neto, a science teacher, to offer the Next Evolution of Work-based Learning core, or N.E.W. school. 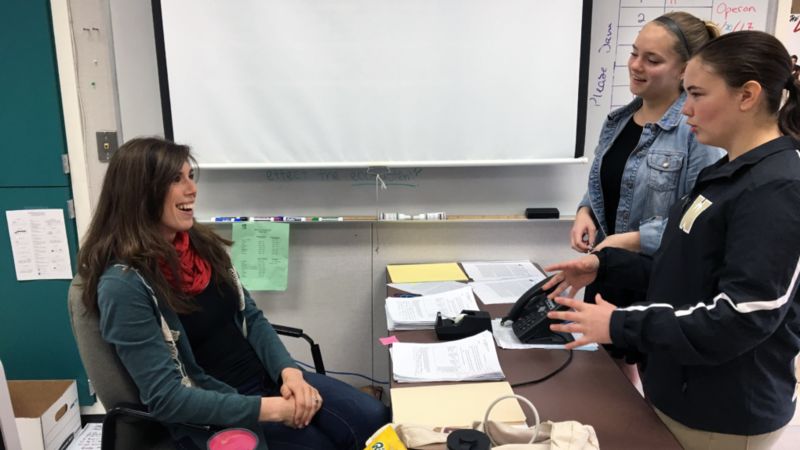 The two teachers share a mix of 60 freshmen and sophomores, teaching them English, science and a technology elective in an interdisciplinary way. Tucker and Neto develop themed units that connect concepts of the science curriculum with the books they are reading and the writing they are doing. For example, in a mental health unit students learned about the neurobiology of mental health disorders and applied that understanding to their reading of "Romeo and Juliet." Each student psychoanalyzed a character, using research to back up claims about how the character’s actions and words indicate they may have had a specific mental disorder. At the same time, students also had to do a project educating a specific audience on some aspect of mental health. Students could work together or alone, and had a lot of freedom to choose how and what they would dive into. One student made an infographic in Spanish and English to educate the Spanish-speaking community about the dangers of depression and where people can get help locally. 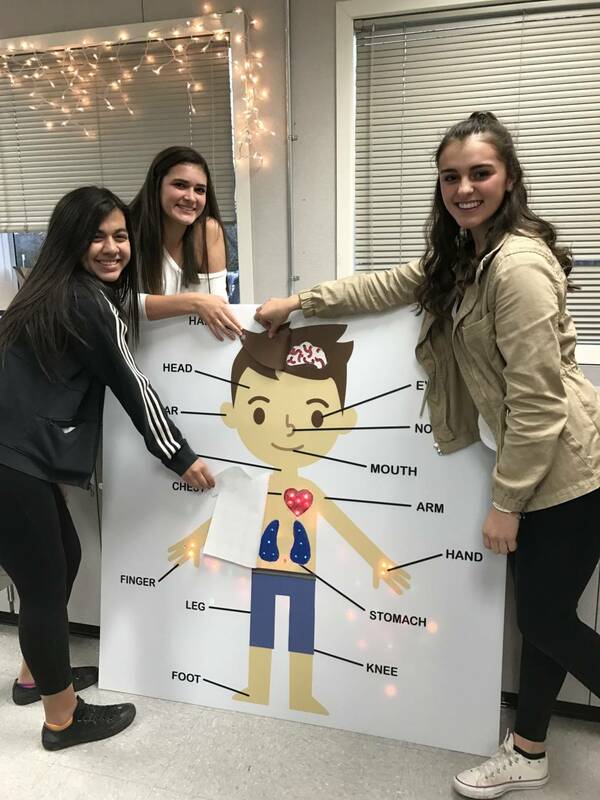 Another group wanted to build a life-size mannequin that could show what anxiety looks like in the body. They weren’t sure how to realize their vision, so they formally reached out to the engineering teacher for help programming a device that would light up when certain parts of the brain trigger or when the heartbeat accelerates. “These girls were never interested in programming and now they’re doing it on their off-time just to complete this project,” said Marika Neto. She’s been amazed at how deeply students are willing to examine a topic when they have the freedom to choose something that interests them and can show their learning in various ways. That’s especially apparent in science; many students claimed they used to hate science, but are loving it the way Neto teaches. Tucker and Neto have their N.E.W. students only every other day, but on core days students are with them for a 4½-hour block that the teachers can program however they want. The co-teachers put together a slide deck for every day with each activity, links to resources, and transition times. Students are responsible for looking at the deck and independently transitioning between activities. Sometimes half the students will work on a science lesson while the other half work on a writing assignment. Other times all 60 kids have “My time” to work on anything they need to get done. The effect is that there’s no herding students from room to room based on a bell schedule. Visitors to class don’t always know what students are working on unless they ask, and often one student will be doing different work from her neighbor. Tucker and Neto don’t formally assign homework, but they try to give lots of work time in class. And students often do extra work on their projects at home if they haven’t been focused in class or they aren’t satisfied with their work. Tucker has also tried as much as possible not to collect and grade work at home. Instead, she synchronously edits student writing in Google Docs. 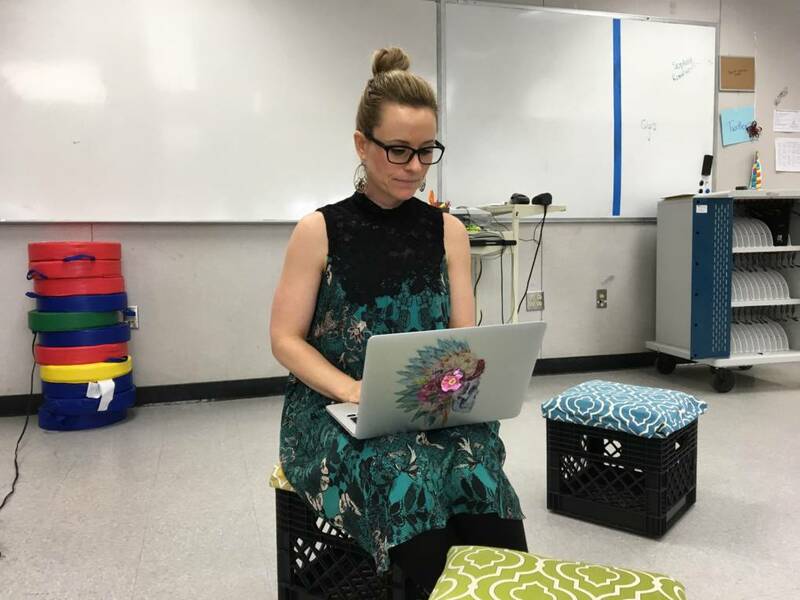 She believes that giving students real-time actionable feedback as they are drafting benefits them more than when she stamps a grade on at the end. Too often students never look at that feedback again. And because Tucker and Neto have complete control of the schedule of N.E.W. core, they can invite outside experts in, plan field trips and generally enrich what happens in the classroom by connecting students to other resources at Windsor High or out in the community at large. One of the big goals of the N.E.W. program is to create a learning environment where students are empowered and supported to be independent learners. That can be a challenge for students arriving to the program with eight or nine years of experiences with teachers who tell them exactly how to do well. Students in the N.E.W. program struggled with the freedom of the program at first and asked for more direct instruction. One of the big ways Tucker and Neto are trying to build student ownership of learning is through the grading system. They are aware that any pedagogical approach must be supported by an assessment policy that furthers the same goals. The grading policy in a classroom can easily send a conflicting message to students if teachers don’t think it through carefully. At the beginning of each unit Tucker identifies the key English and technology standards and Neto picks the science ones. They put those targets in a spreadsheet with columns for students to self-evaluate on each skill, as well as columns for teachers to give feedback and evaluation. Every week students have time to reflect on the work they’ve done and to give themselves a grade 1-4 that indicates how well they believe they are meeting the standard. Crucially, they also have to say why they believe that grade is appropriate and link to work samples as evidence. “The doc is meant to be an ongoing silent conversation between the two of us,” Tucker said. If she goes through and gives a student a 2, that’s not the end of the conversation. The student can then take that feedback, make changes to the work, update his column and ask for the teacher to look again. This process encourages students to constantly reflect on what they are doing well, what they can improve, and to actively use teacher feedback to revise work. “Throughout the unit they're constantly being asked to look at their body of work, look at the skills we're targeting, and identify what pieces reflect their growth or their proficiency, or their developing proficiency in relation to a particular standard,” Tucker said. Since Windsor is a traditional public school, Tucker and Neto have to report out grades every six weeks. At that time they conduct grading interviews with each student in which the student presents the grade she thinks she deserves and evidence to support that claim. The teacher comes with her own grade and evidence, and the two have a conversation about it. “The first time I did a grading interview I was like so nervous,” said Josh, a sophomore student. “But then by the second time it was much more relaxed. And I’m like, OK, I’m just showing what I’ve done and I should be proud of it.” He appreciates that he has a voice in the process and that his grade isn’t arbitrarily decided by his teacher. “I think those conversations were some of the scariest things we've asked them to do because they're not asked to think about their learning that way, articulate where they're at in their learning, and what they think their grade should be,” Tucker said. Students are having to retrain themselves to use those types of metacognitive skills, which is a big shift for them. A conversation after a grade-less interview "It is nice to not be defined by doing bad on one assignment; instead the focus is on my growth"
This approach has also been an adjustment for parents who generally were educated in a more traditional system. They have become accustomed to classrooms where every assignment is graded, and if their child misses an assignment or performs poorly on a test it can start to create a hole in their grade. And, for parents whose children did well in the traditional system, but are adjusting to the independence and autonomy of N.E.W. school, all the changes can be a little scary. 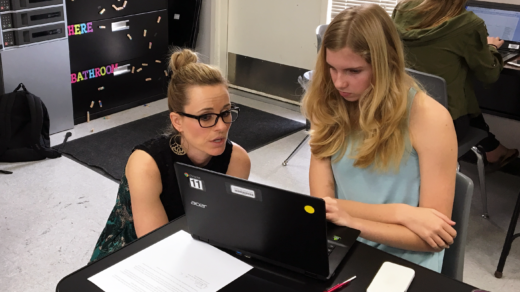 Ultimately, Carstensen decided she’d rather her daughter learn the content deeply, even if her grades aren’t as strong, in the hopes that the many other skills she’s learning in the hands-on, project-based and tech-savvy program will serve her well later. It doesn’t hurt that her daughter is much more excited about school now. Other parents were thrown by the idea that students can go back, revise and improve an initial grade. While foreign to many parents at first, it was not unwelcome. Rooney has been impressed with the passion for learning that the N.E.W. core has brought out in her daughter, Brooke. While Brooke was never a struggling student, she also didn’t particularly like school. Now Brooke is excited to talk with her mom about what she’s learning, how she’s tackling projects and the improvements she’s made. “My other son spends hours sitting at his desk doing homework and I don’t think he’s getting more from his education,” said Dianne Wagner, Josh’s mom. Josh has a twin brother who is in a more traditional honors-track core. Wagner likes that Josh’s schoolwork not only excites him, but that he’s becoming a well-rounded person who can collaborate, juggle project deadlines on his own, communicate about his work and take ownership. And, she likes that when he’s home from school he has time to help out with chores and hang out with his family because he’s not so stressed out by how much homework he has. “What they do here in N.E.W. core is they figure out how to apply the knowledge that they need to learn to the life that they have in front of them, and connecting those dots makes that information more valuable,” Wagner said. Tucker and Neto originally conceived of the N.E.W. core as a way to reach the many students for whom school is “not super stimulating.” Connecting the curriculum to the real world, giving students choice, making science more hands-on and fun, and building in a lot of collaboration are all ways these teachers are trying to shake up the traditional model in order to re-engage kids who haven’t experienced a lot of success in school or who are already checked out. And while there are many students in the program who are thriving in that new environment when they might not have elsewhere, one surprise has been how well the model works for students who also excel at traditional school. Tucker initially worried that having such a broad array of learners in one hectic space would make it hard to challenge her high-flyers, but they’ve told her the opposite. 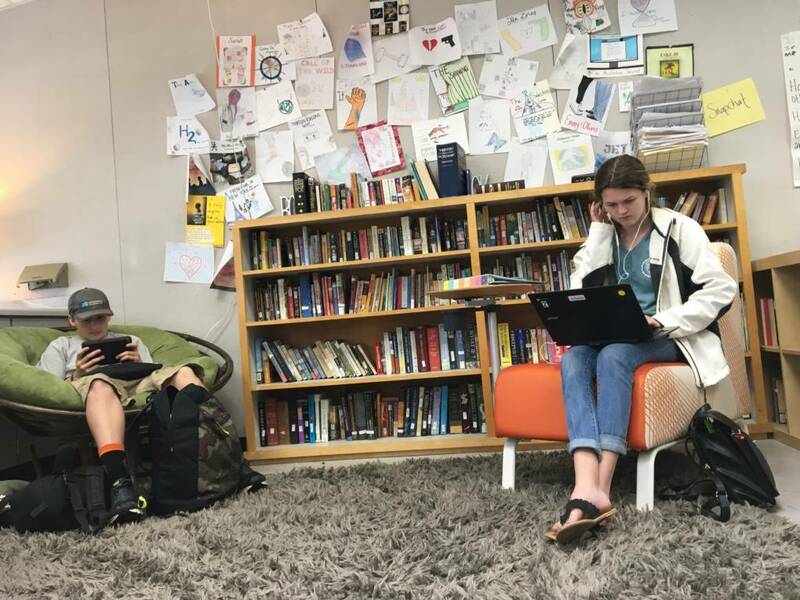 “I have had experiences in past classes where I would do an assignment and I wasn’t super excited about it, but I would still get an A,” said sophomore Samantha Moberly. Samantha is the kind of student who would probably do well anywhere, but she says the freedom she has to pursue her interests motivates her much more than a grade (although she still cares about those, too). "I’m actually working to get to a point where I’m really satisfied with my work. And because I’m grading myself, I’m not just stopping at a point where I know I would get a certain grade. I go until I’m satisfied,” she said. That attitude has allowed her to pursue some impressive projects. In science, Neto gave groups of students corn on the cob, canned corn or packaged corn, and told them they needed to design a lab from the ground up under the theme of nutrition. The “Iron Chef Lab” required students to come up with an interesting question, write a hypothesis, develop lab procedures and carry out the experiment. On top of that, Neto tasked students with identifying specific skills they would need for their labs so she could run skills stations to support them. Samantha’s group had packaged corn, so they decided to test for the effects of Bisphenol A (BPA) -- commonly found in plastic -- on their corn. They couldn’t buy BPA, so they asked the AP Chemistry teacher for help extracting BPA from a plastic water bottle so they could use it in their lab. “They are thinking outside the box and they're being creative and they're having that natural inquiry and they're not just looking to check the box,” Neto said. Ultimately, the BPA didn’t have any effect on the corn, but the group learned a lot along the way. In their reflection, students proposed various other ways they would do the experiment if they had different materials and more time. Needless to say, Samantha’s group won the Iron Chef Lab.